About 2,500 people show up in support for LGBT community. 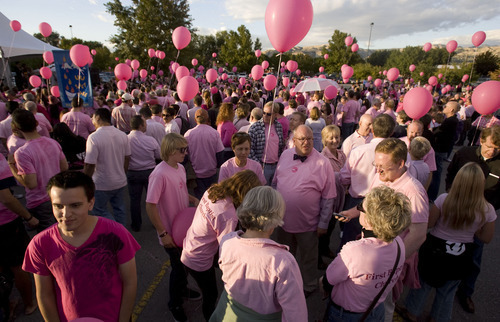 Steve Griffin | The Salt Lake Tribune Eric Fieldsted, of Heber, joined hundreds of Utahns gathered at the parking lot north of Spring Miobile Ballpark in Salt Lake City, Utah to form a giant human pink dot in celebration of LGBT community and National Coming Out Day, Oct. 11, 2011. 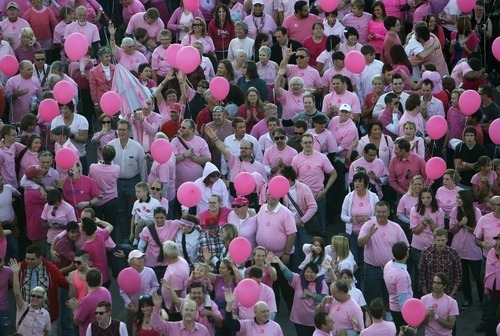 Steve Griffin | The Salt Lake Tribune Hundreds of Utahns gathered at the parking lot north of Spring Miobile Ballpark in Salt Lake City, Utah to form a giant human pink dot in celebration of LGBT community and National Coming Out Day, Oct. 11, 2011. Steve Griffin | The Salt Lake Tribune Hundreds of Utahns gathered at the parking lot north of Spring Miobile Ballpark in Salt Lake City, Utah to form a giant human pink dot in celebration of LGBT community and National Coming Out Day, Oct. 11, 2011. Steve Griffin | The Salt Lake Tribune Hundreds of Utahns gathered at the parking lot north of Spring Miobile Ballpark in Salt Lake City, Utah to form a giant human pink dot in celebration of LGBT community and National Coming Out Day, Oct. 11, 2011. 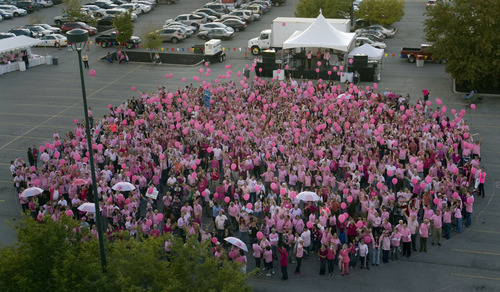 Steve Griffin | The Salt Lake Tribune Hundreds of Utahns gathered at the parking lot north of Spring Miobile Ballpark in Salt Lake City, Utah to form a giant human pink dot in celebration of LGBT community and National Coming Out Day, Oct. 11, 2011. Steve Griffin | The Salt Lake Tribune Hundreds of Utahns gathered at the parking lot north of Spring Miobile Ballpark in Salt Lake City, Utah to form a giant human pink dot in celebration of LGBT community and National Coming Out Day, Oct. 11, 2011. Utahns celebrated National Coming Out Day by coming out in droves to the state's first pinkdot celebration Tuesday. The event brought about 2,500 people to take part in a massive group hug to demonstrate love and acceptance for lesbian, gay, bisexual and transgender Utahns. 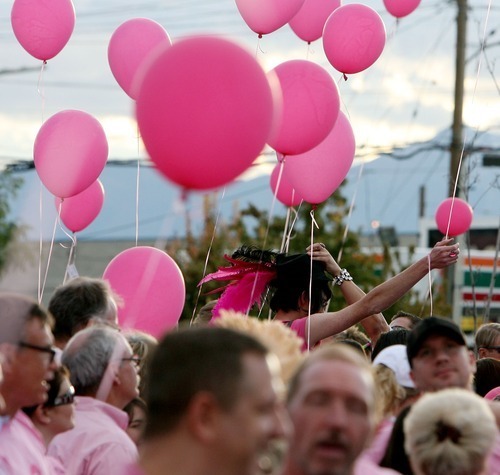 Organizers of the Salt Lake City event, held in the parking lot to the north of Spring Mobile Ballpark, were inspired by the first pinkdot in Singapore in 2009, said Valerie Larrabee, of the Utah Pride Center. The Support Love Courage Council sponsored this year's event in Utah, and organizers hope to make it an annual occurrence to show support for those who are weighing the decision to come out. That message resonated with Trevor Robison, who just came out four months ago. His biggest fear was not being accepted by family and friends, but he found a community to see him through the challenging time. "It just felt like a giant weight was lifted," Robison said on coming out. "There are people out there to help you. You are not alone." Several community organizations and businesses were in attendance at the event, including representatives from First Baptist Church and Utah's Latino community. Denise Winslow came on behalf of Wells Fargo Bank, and brought along her husband, Brent, and daughter Carly. "We believe in diversity," Winslow said of her employer. "You can believe in it, but you also have to show your support." Celebrity ambassadors Kurt Bestor and Fox 13 news anchor Hope Woodside both addressed the crowd, who also heard performances from several local music groups. The moment is like the civil rights movement, Bestor said, adding that politics and religion should be set aside to allow everyone the right to live a happy life. "Like the Constitution says, 'We, the people,' it's all of us," Bestor said. 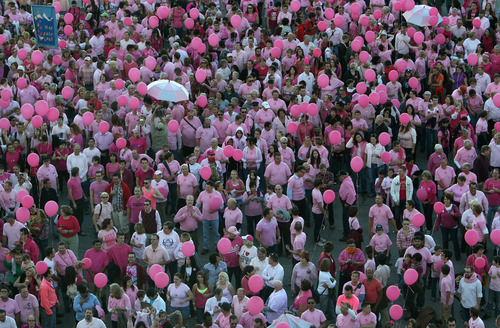 "Part of our melting pot is pink." Most of the participants were young gay and lesbian couples, but there were many families represented as well. Trent Wale brought his son Parker, 8 months, to the event, hoping to give him an early lesson in tolerance. P National Coming Out Day is over, but there are resources and support available to those debating whether to come out. 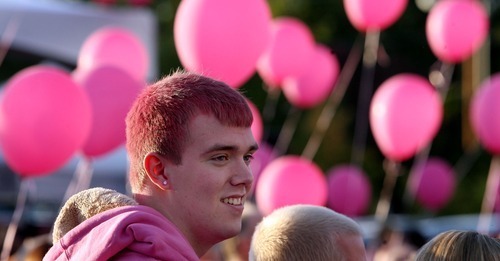 For more information, visit http://www.pinkdotut.org.